We believe in a pluralistic democratic society in which every citizen has an unalienable right to exploit his/her potential for the purpose of improving his/her wellbeing without infringing on the rights of other citizens. We also believe in a system of government, pursuing a mixed economy policy which guarantees meaningful livelihoods for all. A nation of responsible citizens who are politically and economically empowered, productive, prosperous, united by the love of their country, and living in harmony with one another, the rest of humanity, and with their environment. A strong, united, and disciplined party championing personal, cultural and political freedoms of all citizens of Uganda, the rule of law, high ethical standards in Government, security of life and property and justice for all. To lawfully capture state power and form an efficient, effective, transparent and just government which will ensure the rule of law, peace, security, stability and prosperity for all citizens of Uganda and which will forge harmonious relations with all nations of the world. Symbols are important for political and non-political organizations and among literate and illiterate societies because they convey important messages to stakeholders and clients in a concise and crisp manner. They brand organizations. The founders of DP chose a hand hoe as its symbol because it was the commonest and most important tool in the lives of Ugandans. It was the basis of all livelihoods at that time. Despite the passage of time, the hoe is still the primary tool of all rural people who comprise more than 90 percent of all Ugandans. The other 10 percent depend on the food produced by peasants using the hoe. Properly articulated this symbol can carry a very powerful political message. Therefore DP is retaining the hand hoe as the party’s main symbol. These re-formatted principles of the party, have important implications for DP’s membership, on the relationship between DP and other political organizations in Uganda, and for the relationships between DP and political organizations outside Uganda. Ø On DP Membership: All members of the party are expected to embrace these principles and all DP leaders are expected to articulate and propagate these, and not any other principles, when speaking on behalf of the party. Any present DP member who cannot and will not subscribe to these principles, has a fundamental right and honorable duty to leave the party. 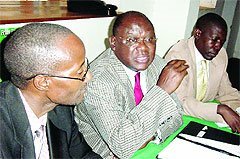 Ø For other political organizations in Uganda: All political parties in Uganda registered separately under the Political Organizations Act. Other parties may not have been aware of our political principles at the time of their registration. We are hereby making these principles abundantly clear to all. Other parties or their members are free to join us if they subscribe to the same principles. If those parties do not subscribe to the same principles as DP, then they are clearly very different political entities. Because we believe in a pluralistic society, we will respect their separate and independent existence. We will however also expect other parties to respect DP’s separate and independent existence. Ø For External Organizations: In global terms, the principles enumerated above place DP in a centrist position. Historically, DP has never been a fascist or right wing party and neither is it contemplating to be so. Similarly, DP has never been a socialist or left wing party and neither is it planning to be so. DP abhors extremism. The party will therefore associate with political organizations in the international arena which share its political ideals. For now, DP is opting to associate with conservative organizations.